This project was started with an important windows CE devellopment studio, but never saw the light of day. The game was to be a top-view vertical shoot-them-up; an old-school game like "Ikari Warriors", "Commando" or "Outzone". The screenshots here are development pictures : a title screen preview (right); two level design samples (below), with an ennemies gallery on the right screen. 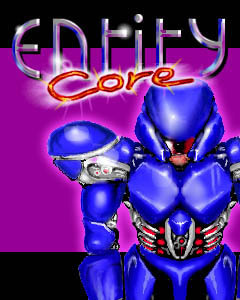 The fun thing about the title screen is that the armor was directly drawn on a Pocket-PC device with Pocket Artist. I intended to add the finishing on Photoshop, but never actually went that far. The players animation and a few ennemies animations were done. If you know a CE developper that would be interested in developping the game, i'd be glad to get back on this project!